The Grille at Gold Dust West Carson City is the perfect retreat from all of the gaming action. Choose from all day breakfast, to burgers made your way, gourmet mac and cheese, or one of our signature dishes including Chicken Fried Steak, Homemade Pot Roast or Country Pork Chops. 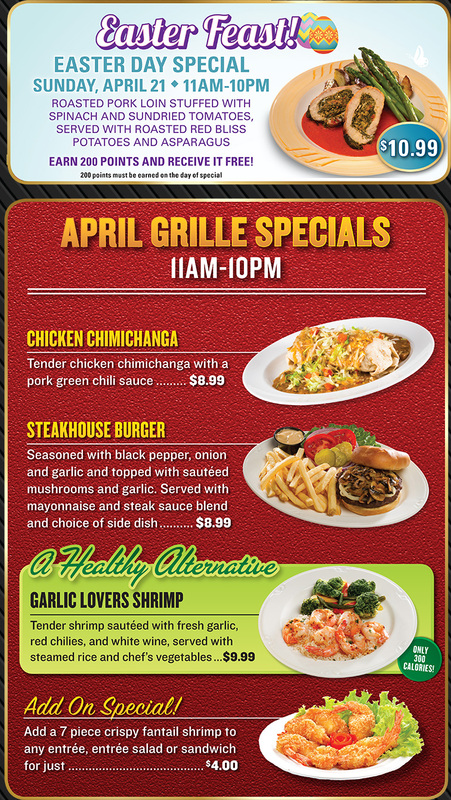 Join us at the Grille for delicious homestyle cooking and a friendly atmosphere 24 hours a day, 7 days a week. Choice of 3 slices of thick cut bacon, 2 sausage patties, or ham served with 3 eggs any style, hash browns or home fries, and choice of toast or buttermilk biscuit. Buttermilk biscuit sliders with scrambled eggs, American cheese and your choice of chicken fried steak or chicken tenders. Served with a side of Country gravy and choice of hash browns or home fries. 2 warm buttermilk biscuits topped with Country gravy. Sausage, eggs, and green onions scrambled together, stuffed into a giant flour tortilla, smothered with green chili, topped with cheese, onion and tomato. Country style corned beef served with 3 eggs any style, hash browns or home fries, and choice of toast or buttermilk biscuit. 2 eggs, cheese, and choice of thick cut bacon, sausage, or ham with lettuce, tomato, and mayonnaise on grilled Texas toast. Served with hash browns or home fries. Dannon “Light & Fit”® strawberry yogurt, fruit, and granola served with choice of toast or buttermilk biscuit. Grilled English muffin topped with sliced ham, poached eggs, and hollandaise. Served with hash browns or home fries. Buttermilk biscuits topped with chicken fried steak, poached eggs and Country gravy. Served with choice of hash browns or home fries. Served with 3 eggs any style, choice of hash browns, home fries, fresh fruit, or sliced tomatoes, and choice of toast or buttermilk biscuit. Our 10oz. chicken fried steak topped with homemade Country gravy. A tender 8oz. sirloin steak grilled to perfection served with 3 eggs any style, hash browns or home fries, and choice of toast or buttermilk biscuit. Served with 2 slices of thick cut bacon, a sausage patty, or ham. Traditional style French toast served hot off the griddle. 2 buttermilk pancakes and 2 eggs any style. 2 light and fluffy buttermilk pancakes. Our 3 egg omelets are served with choice of hash browns, home fries, fresh fruit, or sliced tomatoes, and choice of toast or buttermilk biscuit. Customize your omelet with any 4 items from the list below. Queso stuffed chips topped with seasoned beef, pico de gallo, jalapeños, black olives, served with guacamole and sour cream. A generous portion of wings served with celery sticks and ranch dressing. Grilled teriyaki marinated jumbo shrimp skewers with Japanese style crispy Cole slaw and sweet soy reduction. Loaded fries topped with bacon and melted cheese. A generous portion of crispy beer battered onion rings and battered zucchini sticks. Served with regular ranch or spicy Buffalo style ranch. Lightly breaded chicken tenderloins deep fried and served with ranch dressing or bbq sauce. Fried macaroni and cheese wedges with ranch dipping sauce. Hearts of romaine, parmesan cheese, and croutons tossed in our creamy Caesar dressing, topped with choice of a grilled or blackened chicken breast, served with garlic-parmesan toast. Ham, turkey, Swiss and American cheese, red onions, tomatoes, hard-boiled eggs, and bell peppers on a bed of mixed greens. Crispy tortilla bowl with mixed greens, taco meat, black olives, salsa, guacamole, sour cream, and Southwest ranch dressing. Diced chicken breast, hard-boiled eggs, tomatoes, avocado, bacon, bleu cheese crumbles, and green onions on a bed of mixed greens with bleu cheese dressing. Chunks of pork loin and mild green chiles in a savory sauce. Topped with shredded cheese and red onions, served with a warm flour tortilla. Our 1/2lb. burgers are charbroiled to perfection and served on a grilled bun. Add a patty to make it a pound for $2.99. Substitute a grilled chicken breast on any burger. 8oz. grilled burger topped with shaved deli ham, a fried egg and your choice of cheese. 8oz. grilled burger, served with choice of cheese. Topped with thick cut bacon, American cheese, bbq sauce, and onion rings. 8oz. grilled burger topped with shaved prime rib, sautéed mushrooms and onions with melted Swiss cheese. Served with choice of French fries, homemade coleslaw, fresh fruit, cottage cheese, homemade potato salad, sliced tomatoes, vegetables, or mashed potatoes. Substitute onion rings for $1. Grilled chicken breast topped with avocado, bacon, Swiss cheese, lettuce, tomato and onion. Garlic butter grilled sour dough with crispy chicken parmesan, marinara and melted mozzarella cheese. Seasoned, steaming roast beef served on a grilled hoagie roll with au jus. A triple decker with turkey, bacon, lettuce, and tomato. Texas toast slices filled with American cheese, and tender slow cooked pot roast. Served with au jus for dipping. Turkey, ham, and Swiss cheese served between battered slices of Texas toast. Served with a side of raspberry jam. A tender 8oz. sirloin grilled to perfection. Served on a hoagie roll with steak house style mayonnaise and crispy onion rings. Thinly sliced prime rib grilled on sourdough bread with Swiss and American cheese. Thinly sliced beef grilled with green peppers and red onions, topped with cheese. Toasted hoagie roll topped with jumbo meatballs, marinara sauce and melted mozzarella cheese. Topped with avocado on grilled sourdough bread. Choice of 3 slices of thick cut bacon, 2 sausage patties, or ham served with 3 eggs any style, home fries, and choice of toast or biscuit. Sausage, eggs and green onion scrambled and stuffed into a giant flour tortilla. Smothered with green chili and topped with cheese, onion, and tomato. A tender 8 oz. sirloin steak grilled to perfection served with 3 eggs any style, hash browns or home fries, and choice of toast or buttermilk biscuit. A selection of battered cod, fantail shrimp, and grilled jumbo shrimp skewer. Served with French fries, hush puppies and cole slaw. Battered cod deep fried and served with fries and homemade coleslaw. Grilled salmon filet basted with our honey mustard glaze. 8oz. tender sirloin grilled to perfection, and fantail shrimp with your choice of potato and chefs daily special. Grilled chicken breast served over linguine in a rich creamy Alfredo sauce. Traditional big bowl of pasta & meatballs with marinara sauce. Served with garlic cheese bread. Spinach and cheese tortellini, topped with sliced grilled chicken and a tomato parmesan cream sauce. Served with warm rolls, mashed potatoes & gravy, vegetables, and choice of soup or dinner salad. 8oz. tender sirloin steak grilled to perfection. A 12oz. Cowboy cut ribeye grilled to perfection. Our 10oz. chicken fried steak topped with sausage gravy. Sliced prime rib piled high over Texas toast and smothered in rich beef gravy. A generous portion of tender & juicy roast. 3 tender pork chops seasoned, breaded, and grilled to perfection. 5 crispy pieces of juicy fried chicken.